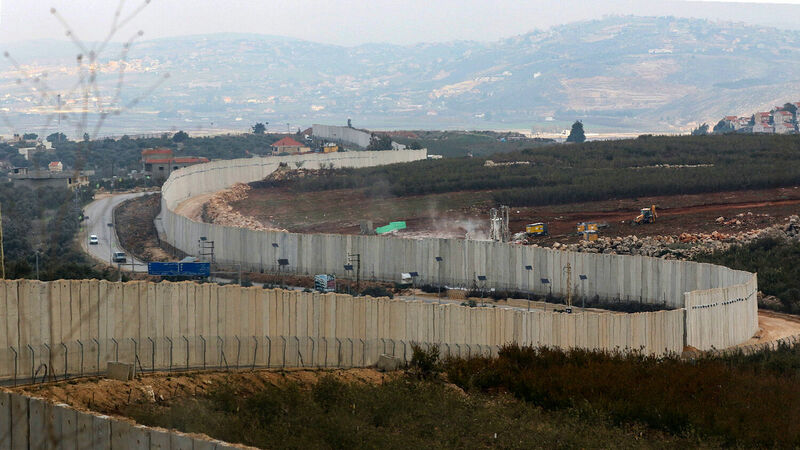 A view from the southern Lebanese village of Kfar Kila shows Israeli machinery operating behind the border wall in Israel (right) on December 4. Israel’s army says it detected Hezbollah “attack tunnels” infiltrating its territory from Lebanon, and it launched Operation Northern Shield to destroy them. A massive underground attack tunnel penetrating Israeli territory from Lebanon was discovered in northern Israel on Tuesday, the Israel Defense Forces (idf) have announced. The discovery is the first tunnel located as part of Operation Northern Shield, a mission two years in the making, whose objective is to detect and neutralize a network of sophisticated secret tunnels created by Hezbollah in order to invade Israeli territory. The discovery of such a sophisticated tunnel (and probably just the first of many) is evidence of a large-scale, Iranian-backed enterprise to threaten Israeli civilians in the north of the country. It proves that Iran and Hezbollah’s threats to conquer Israel are not merely rhetorical but are as real as the rock the tunnels are carved through. As such, the tunnels confirm a long-publicized mission of Hezbollah to conquer Israeli communities in the northern Galilee region. While Israel has the most successful antimissile shield on Earth, including the Iron Dome, David’s Sling and the Patriot system, the increased precision of Hezbollah’s missiles and the sheer volume of the impending attack mean that the defensive shield could be overwhelmed. As these tunnels prove, Iran is actually partway through enacting its plan for the territorial takeover of Israel. Iran is so committed to its plan that it funds Hezbollah’s efforts to the tune of $700 million per year. And that’s even while Iran is under harsh financial sanctions. Our modern, sophisticated, enlightened societies like to believe that we have evolved way past the time of nations being hell-bent on the destruction of others. However, what we are witnessing in the north of Israel is Iran’s manifest desire to do exactly that. And while Israel may be able to thwart Iran’s attempts in the short term, Bible prophecy indicates that Iran will not let go of its genocidal ambitions against Israel, nor its quest for dominance in the region, until it is stopped by overwhelming force. As Trumpet editor in chief Gerald Flurry has forecast for more than two decades, radical Islam, led by the fanatical Islamic regime in Iran, fulfills the role of the biblical end-time “king of the south” of Daniel 11:40. This king leads a group of Islamist nations and is described in that verse as having a pushy foreign policy. It should be beyond clear by now that Iran cannot be induced into becoming a normal nation in the world community. Decades of world powers trying to do exactly that have failed miserably. The fruits of Iran’s long-standing radical agenda, including its unabashed funding of terrorist proxies, such as Hezbollah, are clearly visible to anyone willing to see it. Accepting that Iran fulfills a biblical end-time prophecy might be more difficult to believe. However, the proof is abundant. If you would like to read more about Iran’s role in end-time events, and how Iranian action will actually push the world into World War iii, please order your free copy of The King of the South.